This is an update for Georgia regarding the impacts of Hurricane Matthew as it arrives along the coast of Georgia today, around noon. 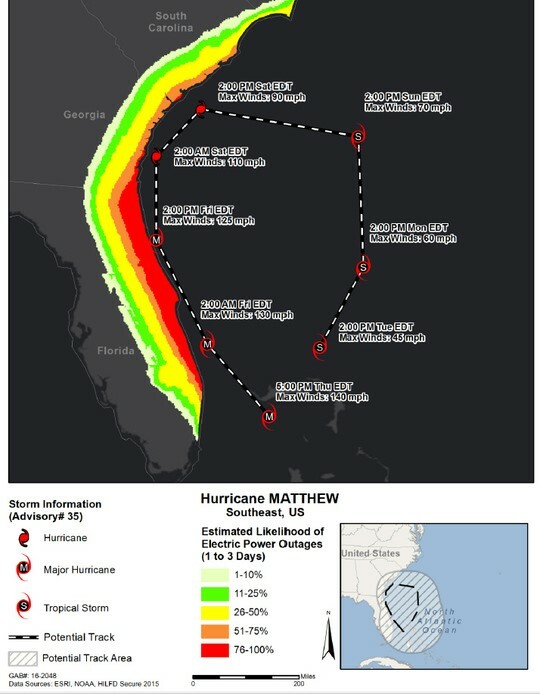 Hurricane Matthew has the potential to be the strongest storm to impact the Georgia coastline in over 100 years. Governor Nathan Deal has declared a State of Emergency for 30 coastal counties and ordered Mandatory Evacuation of Georgia’s coastal area east of I-95. The National Hurricane Center has issued a Hurricane Warning for the full length of Georgia’s coastline, see the latest report here: English or Espanol. Power Outages: An estimated 5 to 6 million people are likely to be affected by power outages in FL, GA, SC and NC due to high winds generated by Hurricane Matthew. In Georgia alone, power outages could exceed 200,000 residential and business properties. Before loss of power: Be sure you have a thermometer in your fridge (at or below 40 °F) and freezer (at or below 0 °F). Freeze containers of water for ice to help keep cold in the fridge/freezer/coolers if loss of power occurs. Group food together to help it stay colder longer. Dry or block ice can help in event of prolonged power outages. During a power outage: Keep the doors to the fridge/freezer closed as much as possible to maintain the cold temperature. Food will remain cold in the refrigerator for ~four hours if unopened. Once power is restored: Check the thermometer in the freezer, if it reads 40 °F or below (or contains ice crystals still), the food is safe and may be refrozen or cooked. Refrigerated food should be safe as long as the power was out for no more than ~four hours and the refrigerator door was kept shut. Discard any perishable food that has been at temperatures above 40 °F for more than ~two hours. Remember, when in doubt, throw it out! 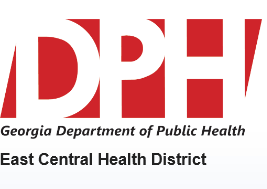 Flooding: Flooding could compromise the water supply and Boil Water Advisories may be issued. Follow the advisory’s directions and/or use bottled water. Discard any foods or beverages that come into contact with flood waters (unless they are in a waterproof containers, which include undamaged, commercially prepared foods in all-metal cans and retort pouches [flexible, shelf-stable juice or seafood pouches]; please note that foods with screw-caps, snap lids, pull tops or crimped cans are NOT waterproof). Tips for Consumers: Have a Family Safety Plan with critical information such as emergency contacts and a list of meeting places; medical records, medications, prescriptions, etc. ; important personal documents, such as birth certificates, Social Security cards, identification or driver’s license, etc. ; and an Emergency Kit. Call your nearest evacuation center and review tips on keeping pets safe during disaster situations. Georgia currently has more than two dozen shelters open for residents, learn more at www.redcross.org or call 1-800-Red-Cross. For pet-friendly sheltering information, visit the GDA website. For information on evacuation routes and transportation updates, visit www.dot.ga.gov. Industry sectors most likely to be impacted include commercial facilities, communications, emergency services, energy, healthcare and public health, and transportation. Additionally, airport closures and damage to agriculture crops and farms could have national impacts. Response Efforts: Many of our resources on the coast have already evacuated, creating a need for additional resources post-storm. Please note that re-entry is going to be limited post-incident; be mindful and take protective measures for you, your business, and your family to be prepared for this incident and the days following. Response and recovery activities will likely not begin until at least 48 to 72 hours after tropical storm winds have ended, to ensure responder and public safety. Join the conversation by following us on Twitter & Instagram @GDAFoodSafety. We want your feedback. Please fill out our short survey.